The Korg Volca Bass is a powerful and fun to use analog bass synthesizer. It can create a diverse array of fat, funky, and aggressive sounds - everything you need to create the ultimate bass lines. 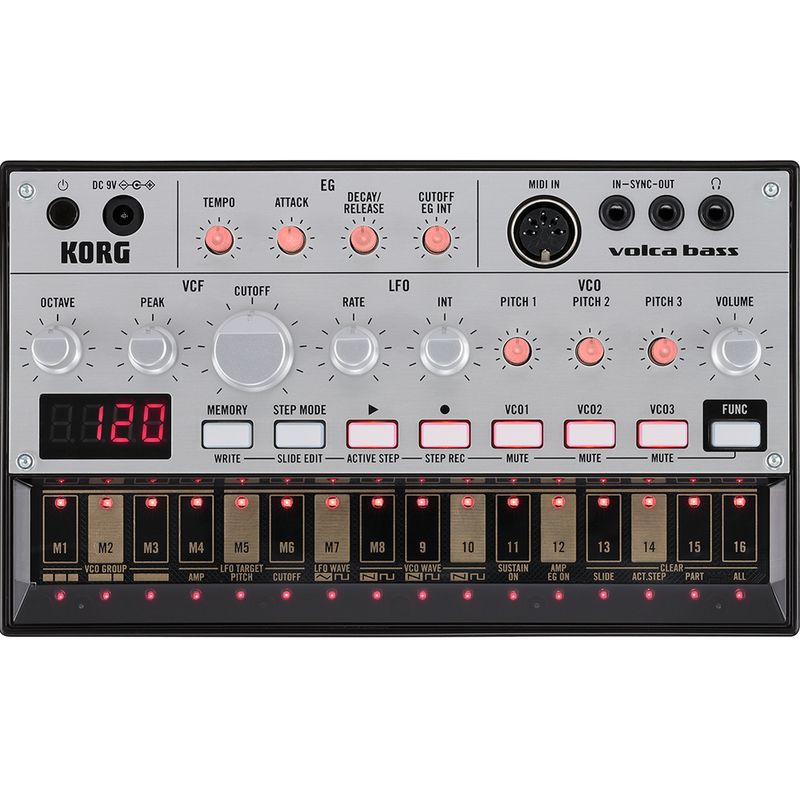 Volca Bass is part of the Korg Volca series, along with the Volca Keys lead synthesizer and the Volca Beats rhythm machine. Equipped with sequencing/recording capabilities, it can be used with multiple Volcas or with a monotribe via the sync in/out, and with your favourite DAW software or MIDI keyboard via MIDI In. Battery operation and built-in speakers mean that you can play anywhere, anytime. You can send note messages from your DAW and use the Volca as an analog sound module, and use the "SyncKontrol" iPhone app to wirelessly control tap tempo, swing settings, and synchronized playback with iOS music apps via WIST. Whether used with the Volca Series or by itself, The Disc promises you that the Volca Bass will inject power into any performance or studio setup. The Volca Bass is an ideal introductory instrument for learning the fundamentals of synths. In addition to the three VCOs, it provides a single VCF, VCA, LFO, and EG. Three oscillators generate thick, modulated sounds and can be used in a variety of ways, such as weaving three different phrases together, producing simultaneous bass and melody lines, generating thick unison sounds or by setting their pitch to 0, +3, and +7 to produce a chord. 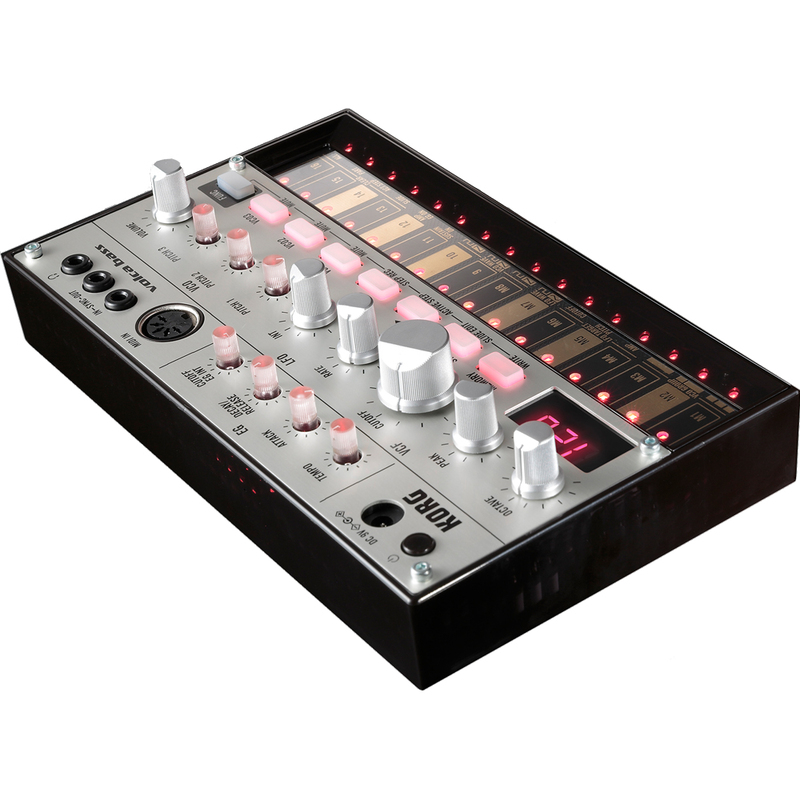 Other features include an analog filter and a Peak knob to create great-sounding distortion, making the Volca Bass great for acid house. The loop sequencer distilled from the Electribe is designed to make editing easy. You can also enter completely different phrases for each of the three oscillators, and play the touch panel keyboard to record in real time. Up to eight sequence patterns can be stored in internal memory. 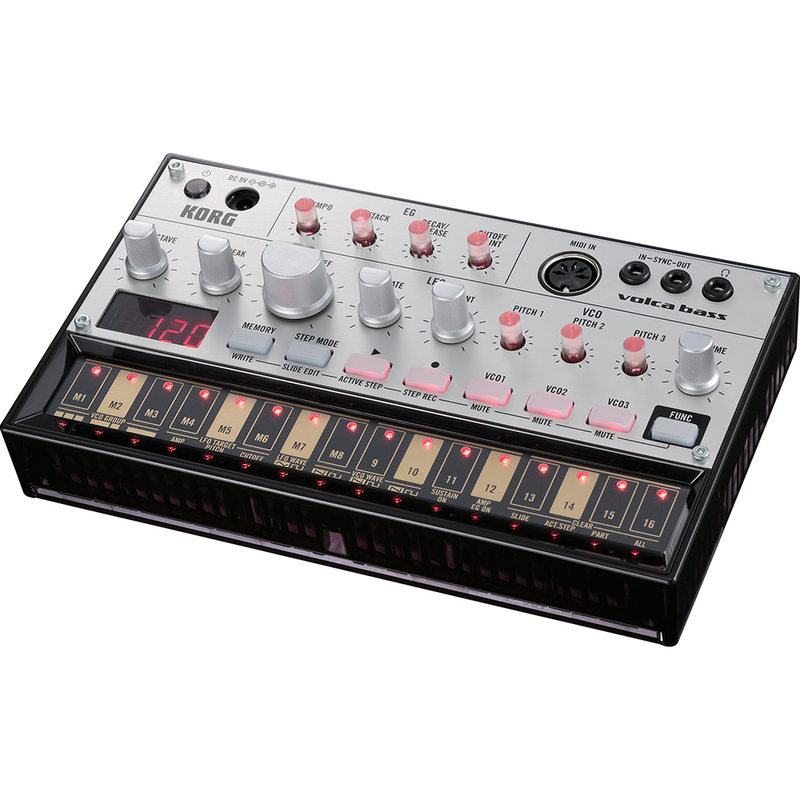 The volca bass provides a Slide function that creates the impression of connected steps, making it easy for anyone to produce acid sounds and allowing for dynamic performances. The Self-tuning function constantly tunes the oscillators. You'll never need to tune during a performance, or wait for the pitch to stabilize after turning the power on.